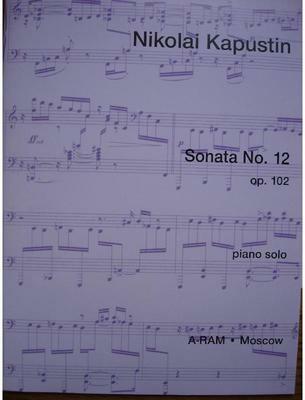 Kapustin composed his twelfth Piano Sonata, op. 102, in 2001. This two-movement work is written in his mature style; whilst undeniably influenced by jazz and rock it is more complex, both rhythmically and harmonically, than some of his earlier compositions. The opening Allegretto is pure jazz fantasy and sounds improvised throughout, while the Allegro assai that concludes the Sonata is a fiery jazz-rock rollercoaster with numerous twists, and a spine-tingling coda ending on the outermost reaches of the keyboard. What do you want to know about Sonata No 12 op 102 by Kapustin?